That’s why a group of Bethesda Terrace residents have a standing date each and every morning in the dining room of their retirement living community, which is located just off Telegraph Road in Oakville. They call themselves “The Breakfast Club,” and on any given day, 10-15 of the group’s “members” can be found seated around several tables pushed together along the edge of the room beneath a picture window. 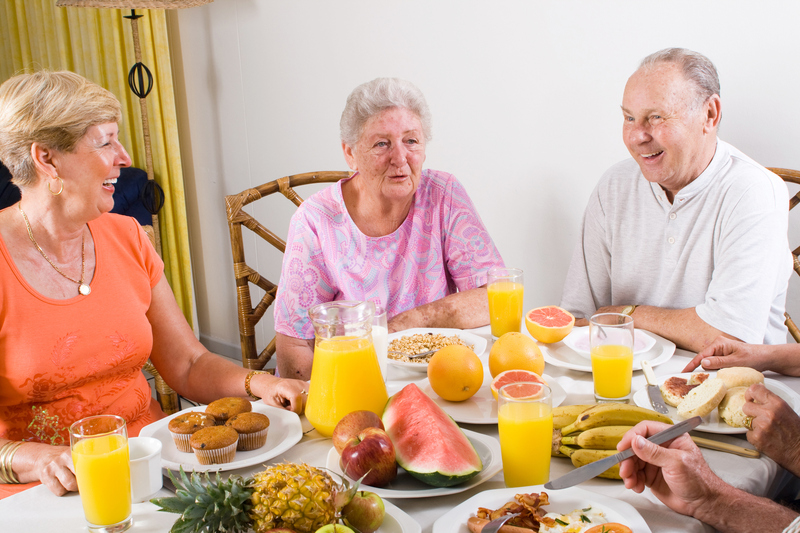 Advantages of residing in an independent retirement living community include the fact that seniors there don’t have to worry about maintenance, security or cooking meals if they don’t want to do so. But one of the best things about independent senior living is that, instead of living alone in a solitary house, residents live among people with common interests and concerns. That makes it a great place for seniors to socialize and meet new friends. The Bethesda Terrace Breakfast Club starts to assemble each morning at about 7 a.m., and its members get caught up with the latest information – or gossip – over a restaurant-quality meal. They go through their business casually, meandering from one subject to another — and usually break up by about 8:30 a.m. to get on with their day. Only one topic is off limits from the group’s spirited conversations. Group member Antoinette Gordon said the Bethesda Terrace servers look out for the members of the group, helping to set up the Breakfast Club’s meeting area and making sure everyone gets their meal cooked just the way they like it. Like all close friendships, though, members of the Bethesda Terrace Breakfast Club are there for each other in good times – and in bad. When someone is sick, the odds are that one of their peers has been through something similar before. So the members can talk each other through their issues, offering helpful tips and reassurance. Lately one of the most prominent members of the group, Marion Reeve, has been feeling under the weather. Marion, who usually sits at the head of the table, has been sleeping in and has been having her breakfast in her apartment. Though Marion is missed in her absence, the gathering continues on – but Teddi stepped away from the table in the middle of her meal to go to Marion’s apartment to say hello and ask how she was doing. Marion said it wouldn’t be long until she was back at her reserved seat. Members of the group don’t just get along like old friends. In some cases, they really are old friends. The latest person to join the table is Milt Siminich, who mentioned in conversation that he used to work at Monsanto. The revelation grabbed Teddi’s attention, as she worked in the same plant for 20 years. It turns out the pair are long-lost colleagues. She even found a photo of them together at a company event. The members of the Breakfast Club group have joined one-by-one over time and new faces are always welcome, whether it’s a visiting relative of one of the members or a new resident of Bethesda Terrace eager to make friends. While it might seem like a pretty exclusive club, getting into the Breakfast Club isn’t difficult. You just have to have one of the members invite you to the table – and you have to be able to hold up your end of the conversation when you get there. At Bethesda, our independent retirement living communities foster companionship through a wide range of scheduled activities. Schedule a tour at a St. Louis area independent living community near you to learn more.